Wow... Bernina... There are people who shop for sewing machines. Then there are people who shop for Bernina. Known far and wide for its stellar quality, at BERNINA, quality standards are always in the foreground. Passion, precision and discipline produce top machines and accessories. BERNINA guarantees quality, so you can turn your ideas into reality.You have a passion for creating clothing, quilts or textile art. And BERNINA has a passion for creating machines that fulfill the highest quality standards. BERNINA always has you and your needs in mind. As a family business, BERNINA wants to ensure that your creations can be implemented with the best technology and thus bring enjoyment and well-being to your family. Function definitely follows form in Bernina's state of the art, game-changing (and did I say, "awesome"?) sewing and embroidery machine. From the elegant and user-friendly interface with a fully integrated touch screen to the largest embroidery field on the home market, imagine a machine that automatically responds to your needs. The presser foot automatically lowers at the start of a seam and lifts again at the end. 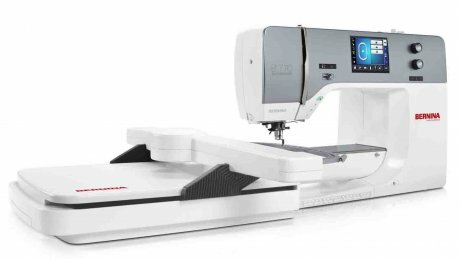 The Bernina 880 even cuts the thread for you at the end of a seam or color change in embroidery. The feed dogs raise and lower automatically for free-motion stitching and embroidery. Fully automatic threading is yours at the touch of a button. And when the bobbin runs out, the machine will cue you to replace the bobbin thread. Simply by opening the bobbin door, the bobbin case presents to you, making threading your bobbin easier than ever. And with almost 2 times the amount of thread capacity on the bobbin, you'll sew further and longer than ever before. But worry not -you can wind bobbins while you work. Experience sewing and embroidery at their finest with the exquisitely engineered BERNINA790 sewing and embroidery. Coupling BERNINA's famous hook technology with its newest innovation - Adaptive Thread Tension, BERNINA is famous for the highest stitch quality available on a sewing machine. Bring your creative sewing dreams to life with an 9 mm wide stitches and BERNINA's Stitch Designer - yes, you can design your own machine stitches now! You'd be hard-pressed to find a nicer machine that incorporates BERNINA's 120+ years of sewing history. Come by for a test drive! 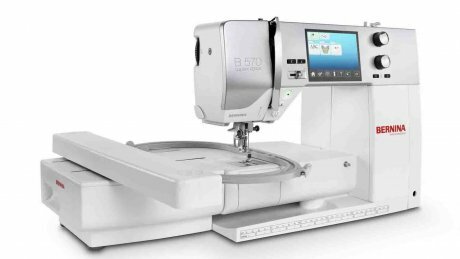 The BERNINA 770 QE is ready, willing and able to tackle all of your sewing and quilting needs. 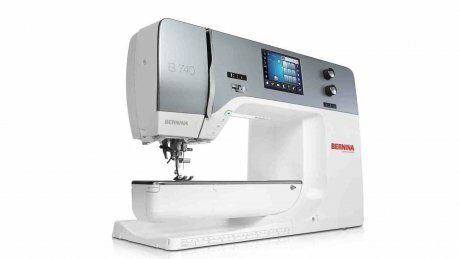 Incorporating the same 9 mm hook and bobbin system as the BERNINA 790, the 770 also boasts built-in dual feed, and comes equipped with the BERNINA Stitch Regulator for perfect quilting stitches. With more than 990 stitches built in and a maximum sewing speed of 1000 stitches per minute, you'll finish more projects in less time with more precision than you ever imagined. And... if you ever decide you want to add embroidery, it's as simple as adding the embroidery module. With the simple user touch screen interface, from monogramming to free-arm embroidery on onesies, you'll be well equipped to tackle any project. The BERNINA 740 is the little sister to the BERNINA 770 QE, but to say that diminishes the awesome power of this amazing sewing machine. 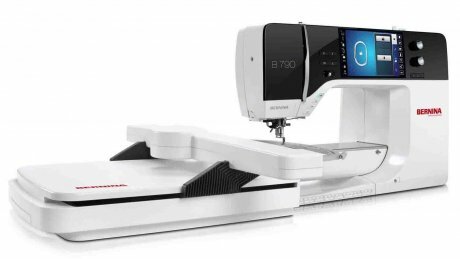 Sporting the same technology as the BERNINA 790 and 770 QE, the BERNINA 740 is a straight-forward sewing machine. And when we say straight-forward, we mean just that...with bells and whistles thrown in. 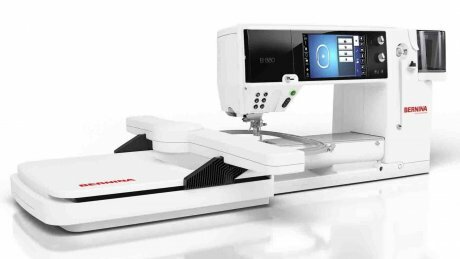 You'll love BERNINA's revolutionary Adaptive Thread Tension, automatic presser foot lift (and knee-lift, to boot), automatic thread cutter, speed adjustment, touch screen, automatic needle threader, and 800 built-in stitches. Couple that with a maximum speed of 1000 stitches per minute, the stunning, automatic buttonhole foot, and BERNINA's stellar reputation for quality, you'll enjoy many, many years of sewing. If you sit the BERNINA 580 next to the BERNINA 880, you'll immediately see the shear difference in size between the two machines. When you look under the hood of the BERNINA 580, however, you'll see she is loaded to the hand wheel with features that would make most other machines envious. Sporting nearly 7 1/2" to the right of the needle, 1000 stitches per minute, a color touch screen, nicely sized extension table and the BERNINA Stitch Regulator included, you'll be ready for any project. From fashion to quilting, from home decor to leather work, from embroidery to heirloom sewing, with 935 built-in stitches and 9 mm wide stitches you'll have ample means to express your creative sewing genius. And her embroidery - stunning! With an embroidery field size of 6" by nearly 15 3/4" and the ability to do free-arm embroidery including cutwork, the possibilities are endless. The BERNINA 570 QE is the newest addition to the BERNINA line. 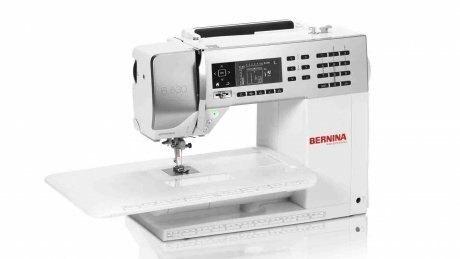 A marvel of engineering, BERNINA brought the 570 QE to market specifically with the person who has a penchant for perfection and precision. Sporting the same BERNINA oscillating CB hook as her companions (the 530, 380, 350, 330, 215), you will not find a straighter straight stitch on any machine. With a robust stitch width of 5 1/2 mm, 642 built-in stitches and a maximum speed of 900 stitches per minute, the BERNINA 570 QE is ready to provide you years of sewing pleasure. Interested in machine embroidery? 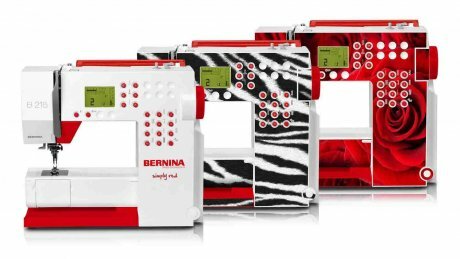 It's as simple as adding the embroidery module to access BERNINA's world of beautiful embroidery. 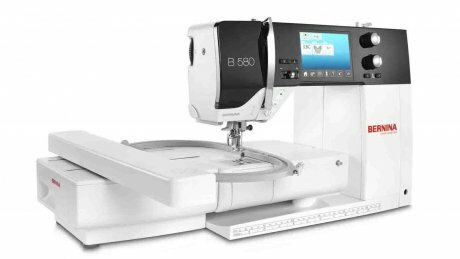 Prepare to be completely spoiled for any other machine once you experience the BERNINA 560 sewing machine. With a top speed of 1000 stitches per minute, 700 built-in stitches up to 9 mm wide, an automatic needle threader, full color touch screen, low bobbin thread indicator and upper thread sensor, speed control, free hand system, 11 needle positions, the BERNINA 560 is ready for everything you're ready to sew. Available as a stand-alone sewing machine, if you start itching to set your creative sewing heights higher, embroidery is as simple as adding the optional embroidery module. Sporting BERNINA's oscillating CB hook system, masterful, precision sewing is easier than ever with the BERNINA 530. With a maximum speed of 900 stitches per minute, nearly 7 1/2" right of the needle, 5 1/2 mm maximum stitch width and maximum stitch length of 5 mm, 395 built-in stitches, automatic needle threader, adjustable presser foot pressure, separate bobbin winding motor, needle up/down, speed adjustment, free arm system, temporary and long term stitch altered memory, the free arm extension table and carrying case are icing to this amazing cake of a sewing machine. 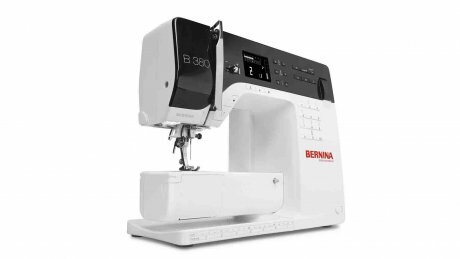 Top of the line of the 300 series, the BERNINA 380 is the top of its class in BERNINA quality, precision and features. 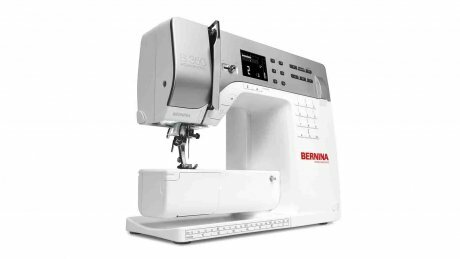 Those "in the know" will appreciate that the 300 series machines are engineered using BERNINA's legendary oscillating CB hook system, providing what aficionados know to be the straightest straight stitch in the home sewing market. With a maximum speed of 900 stitches per minute, a maximum stitch length of 5 mm and stitch width of 5 1/2 mm, BERNINA's free-hand system, LED lighting, automatic needle threader, free arm extension table and carrying case, 221 stitches, two programmable alphabets and automatic buttonhole, the BERNINA 380 is definitely a top contender for those looking for a sewing machine that is feature rich, is compact and portable. Oh! And the BERNINA 380 comes fully equipped with BERNINA's exclusive latch-on feet. 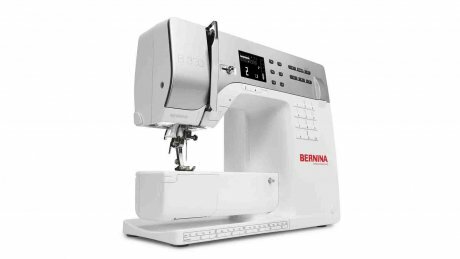 The first in the line of the BERNINA 300 series, the BERNINA 330 doesn't lack on features. With almost 100 built-in programmable stitches and an automatic buttonhole, needle threader, temporary altered stitch memory, automatic bobbin thread take up, LED lighting, free-arm extension table, carrying case and a longer than average power cord (it doesn't sound like much - until you try to plug in your sewing machine...), the BERNINA 330 is a great machine if your are looking for the "right" machine that won't overwhelm but won't disappoint. The BERNINA 215 Simply Red sewing machine crosses all the "t's" and dots all the "i's" for beginning and avid sewists alike. Serving up just the features you need to complete any sewing project, The BERNINA 215 Simply Red sewing machine is as robust as any sewing machine. (We've even used it to do the top-stitching on leather cowboy boots!) Ideal as a primary sewing machine for newbies and aficionados alike, the BERNINA 215 Simply Red sewing machine will also delight those looking for a practical, light weight, compact machine. 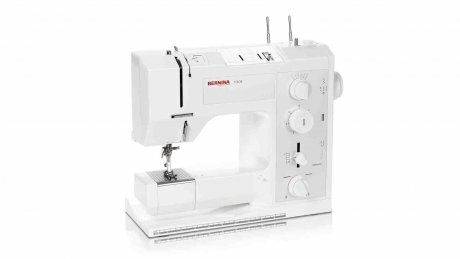 The BERNINA 1008 - what can we say? If you're looking for technology that is tried and true but remains state-of-the-art, you won't find a better mechanical sewing machine. Period. Sewing all fabrics - from chiffon to leather with equal aplomb, the BERNINA 1008 is truly a dream. The advantages of a mechanical sewing machine lie in its incredible durability and ease of operation. (Russell has a BERNINA from 1939 that works as well today as it did in 1939!) Experienced sewists will appreciate the mechanical sewing machine’s direct access to all of the machines functions. Those just beginning will appreciate the complete control over every feature of the machine.